Randall's ESL Blog - For ESL/EFL Teachers and Students: Free Time Activities: What if . . .? If you had free time today and you could do anything you wanted to do for the entire day, where would you go and what would you do? Personally, I really enjoy the outdoors, specifically hiking. 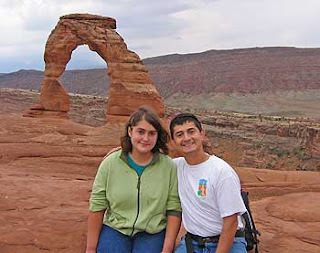 In Utah where I live, there are many state and national parks, and one of my favorites is Arches National Park (see picture here of me and my daughter when we visit the park years ago). It is just fun to get away from everything (the crowds, computers, cell phones, email) and just relax in nature. So, what would you do if you had free time? travel can make me relax, I like to travel, too. Wow! The scenery is very beautiful. I agree with you. Outdoor can make our body relax. It's greatest view I've never see. Wow! The scenery is very beautiful. I think outdoor can make our body to relax. If I have free time, maybe I will go outdoor to anywhere. I will go to beach or climbing mountain to breath fresh air. It's feel relax. When I felt sad I will want to travel with my friends. Traveling is a good way to let you far away from the city. I'd like to go a place that fay away form my home. But I don't like to go out alone, I need at least a friend. If you are free, you can take a trip . It will ley you relax. I would like to go to the country, climb the mountains and get some fresh air. It is comfortable to be in the quite place and without dirty air. when I felt stressful, I journeyed frequently to contry or somewhere quite. I hope someday that I can hand out in the contryside with my family! If you have free time, you can take a trip. It will let you feel relax. Travel is a good active. I like it, too. The scenery is very special!! I like to travel, too. Because travel make me relax and fun!! My dream is to travel around the world. I want to see beautiful scenery and the culture among different countries.It can enrich my life. Its another way to mention that you enrich in a trip? I really like to travel around the world, it makes me happy and relax. Even if I don't have enough money to have a trip, I will go cycling around my city. It is also a good way to relax myself. I love to travel.So, I'm planning to go other country, Eroupe. unfortunately i raised in week family , my father was hardly tallking to me , my mother was always busy in home stuff , and that is for sure affect me negatively , the thing i must avoid in the future with my kids .For my it is not important to get mony as tallking with your own childrens even one hour per day . This is because I am a full time house wife, I just want to have my own time without my family. If I had free time today and I could do anything I wanted to do for the entire day, I would play golf in the mornig, go swimming in the afternoon and get a massage in the evening. During the golf game I could feel the green nature and can relax. From swimming I could relieve my muscle and get a good shape.Finally, massage, it can help me maintain physical, mental and emotional well being. The most important thing is I can get away from my busy life during those things. My name is Fabio and I am from Brazil. Well, here in Brazil we have many beautiful places to hiking and personally I haven't been to most of them. We have wonderful beaches, parks and also very good restaurants and theaters. But, Brazil is a very large and big country, and unfortunately travel expenses here are a little high so we can not travel very much. One thing I enjoy is reading and watching movies. I try going to the beach at least once a year (or to other beautiful place) with my wife Carol, my son Pedro and eventually some friends… Thank You for the website, it really helps me a lot. Hi I absolutely go with Randal in his story. Life and family more important for us anyway, but often we realize that only when it's too late. It's hard sometimes to afford yourself be free, independent, love life and appreciate what we're having in this moment, but personnaly I think that we have to tend to it, coz this moment never be the same again. Hi, I'm from Brazil. I live in a small town and here life is not that stressful, I mean, you see nature next to you. So if i have free time today, I'd like to do some activities like going to SP, a big city, and do some shopping. In relation to be with our children doing something that they really like, I strongly agree with you. And be away from technological things, like you said, is the best way. So we can talk and know more about our children. Your site is really amazing. Thank you! In my case, when I have free time, I usually take a rest in home where I don't think anything and don't behave anything. and sometimes I just turn on the computer and TV, next to wander over the world wide website and switch TV channel or play computer game and watch the soccer game in EURO. I'm really crazy about soccer game in EURO so that sometimes I get up early or stay up till late for watching the game because I live in Korea. However, I have to change my mind because I just like watching and don't like exercising. My body seems to need exercise, but I don't do that. So I make a plan for learning to swim and taking to weight training on next month. Hi, my name is Daniel R. and I'm from Peru. I have English classes every day very early and then I go to the office in a Ban in Lima. I like travelling in my free time but I can't at the moment. Hi I'm from Peru, well I still remember when my father expent time with us, he took us to the beach, and that was great! Because it's relaxing and you can share many good moments. I am from China, my hometown locates in the southeast of China. We can go hiking when we have free time. It is amazing to climb mountains or walking along the beach enjoy the sea breaze. Hi, I live in Vietnam. I am very busy, so whenever I have free time, I often spend time with my family. We often go to the countryside to go sightseeing or visit some of my friends at the weekend. I like taking my son to the river or go along the greenfield. I show him a lot of interesting things. My son likes watching alive insects or big red sun at the sunset. Yes, nature is so beautiful. I'm from Italy, I live near Rome and, when I can make me relax, I go to Rome and I walk in the archeological zone, between the ruines of ancient temples: everything there is silent and quiet and I can forget every problem and relax completely. I totally agree with your opinion that family is the most important part of our life! Harmonious relationship at home is the basis of our accomplishment in career. Maintaining good relations in our home needs lots of effort and sweat but it is quite worth them. Doing some physical activities (hiking, camping, climbing, swiming etc) together with our family members is a pretty good method to improve the family relationship. Doing sports can relax us mentally so we are more easily and openly to express our ideas and feelings and then this promotes inter-understanding. In my opinion, this will dramatically decrease family quarrels and divorce. All in all, more communication we make, less family problem we have! I love travel. As I grow older, I like to live in different places so I can know the people and cultures better. By the way, my name is Hong and I'm originally from China. My name is Duarte and I am from Brasil. I agree with our friend Randall, who is in the best way in my vision. Taking care with our family is the good manner to stay happy today and in future. I like to go biking with my two kids - Paula is 22 and Cassio is 18. We have ride for 30 kilometers. We enjoy going to the beach too, about 310 km from our house, in the São Paulo South Beaches - named Peruibe. There is beautiful place, full of peace, where all the family can stay a little and talk about life, behavior, work,studies and planning our near future. All of us love to make phisical exercises and myself think this is very important to stay healthy besides apropriate food. Love and support your family too! I like running with my oldest son and practising my English with my daughter. There isn’t anything more important in my life than spending time with my family. I don’t have kids, but my incredible two dogs can play this role perfectly. Go for hike, or sitting in a park with my wife and my dogs worth more than a million dollars for me. In our vacations we usually put ourselves in contact with the Mother Nature. The most important thing to do for us, in this situation, is to meet animals in the wildlife. In our last vacation we went Australia. When we got there, we rent to a motor home and got the highway. Almost three thousand kilometers with koalas e kangaroos. We met a lot of them in the national parks, trees along the way and so on. Seeing animals into the wild is gorgeous. I have no words to describe this kind of felling. Two years ago, we were in Alaska, to see bears, mooses and seals. Unfortunately we couldn’t find any of them out of Zoos, buts was a great trip as well. I find spendinfg my free time outdoors the best way to have really a good rest. It's so relaxing to be in nature and enjoy its sounds and smells and the whole atmosphere. At such moments I feel harmony with myself! When I was child, I liked to read comic books, watch TV, play PC game in my free time. I seldom went out to close nature until I realized that travel is a wonderful thing. We can see beautiful scenery, get fresh air, make your mind widely, and you will think "everything will be fine." I love to take trip when I feel stress of work, it makes me comfortable. I am a university student. Most of the day I spend studying. So I have very little free time. Free time with me is a strange definition. But as I can see around me, people have a lot of things to do in their free time. Some go out with their friends or family. Some stay at home to prepare a family meal or watch TV together. The others get a trip to a far away region. Beaches and mountains are good choice destinations. Personally, I always stay at home to do something that I feel useful, for example surfing the internet to know what is happening around the world or the country. Sometimes I go to meet my old friends. But most of my free time activities tend to help my study. At times, my sister says that I will become mad if I continue to live such a life. But I think that as long as we do what we want to do, we feel our life worthy. I live in one of the most stressful countries in the world: Mexico City; that´s why I know how important it is to get away from all that and relax in a beautiful place everytime I can. I hope some day I can visit Utah, it looks fantastic. I like to watch sea shore,specially in the evenings, during sunset.In addition to this I like to go to temples.It doesn't matter I pray or not but I like the serenity over there.I get mental peace. I would hang out with friends, go to the movies, to the pool or to the museum... And I wouldn't forget to call my family on skype! Also, THANK YOU SO VERY MUCH Randall for this amazing website and all you do for us broken English speakers! every body likes travil to spend good time with family or frinds. Thanks. I agree with Randalls about which things are the most importan in my life. Usually I spend a lot time whit my daugther and I try to teach her some thing while we do different activities out home. I fully agree with you that family is importent and spend time with as much as we can is a great thing. I think whatever you do with your family you have to watch God`s ways, when you do that you will have correct priorities. hello everybody! im so glad to me you!! in my experience! the parents want to have a good relationship with their childre so they has to be their children's friend.In my country,a lot of family. The parents can't find out the way to talk with their children. i know that, and the children in fact don't want to talk with their parents. The parents should have a lagre of time beside their children. My childhood memory is work-ricefield days with my family...Despite the work is heavy but everyone is so happy and lifeful. My family is the best reward, gift that God gave me, i couldn't pay anything more, they are patient, so funny, understandig and always when I have problems they suport me and talk with me and they gave me the best advices in the world, they are like my best friends, and i can trust and talk whit them and i'll always be with them. When they have free time we loved to travel and know new places in family and we really enjoy to eat, always we ghatered for eat and tell some gossips each other. wow~ that scenery seems really special! I also like going travel and enjoying my free time in relaxing. If I have a free time, I want to go new-york. I live in california now, so it must take long time to get to NY but I'll go there as soon as possible. Because The nature scenery like you traveled is great but I prefer to the big city that many people walk around and the lights are shining. Free time is rare for me nowadays because i have many things to study and a lot of work to do, but when i have free time i enjoy it very much. Firstly, my favotire free time activitie is to travel. For me travel is the best thing to do when i am on vacation. To illustrate, yesterday i arrived in home from a pretty beach near to my city. I traveled there to enjoy the carnaval. Overall, have free time today is rare for me, however when i have this time i try to enjoy it doing what i want and what i most likely to do is travel. I think traveling is one of the best ways to spend time with your family. My husband and I spent many summer vacations hiking and biking with our three kids in Colorado and Utah. We loved the majestic mountains in Colorado and the red rocks and vivid blue skies of Utah. It was a great way to share the beauty of the United States with our kids. Our kids are grown, but they still talk about the great trips we took together. My family and I love to go at the beach. We usually go at the Miami beach once a year. My child loves to play with the sand and he makes sand castles. We usually do BQQ, we play with the waves and my son loves surf boarding. In my free time I love to play with my children.I live with my famyli in Wisconsin.The wather here is very cold in the winter,and I can't play aut side with my children. But in the summer I love to ride bikes around my town and around the park.I love this time.I always like to ride bikes with my children.I think every body likes this time. In Matamoros, Mexico, the weather es very hot in summer. When I have a free time, I like to spend time with my family in places that have water. In ths city we have The Bagdad beach. We buy some meat and we cook it on woodfire. Normally at 4:oo in the afternoon, when the sun is not too hot. We come back home at 11:00 in the evening. We usually take a shower on the beach and then we cook. We get fresh when the weather is very hot. When the sky is clear we see the beatty moon lying in the sand. I like to talk about my vacation. If I have freetime, I like to travel to onther country, I enjoy this very much, I traveled to Iran, turkey. I have plans for next year, I`II go to canada and Europe. I like to travel because I want to see onther culture. If I travel to any country I choose big ctiy in this country. My best idea for vacation is traveling because I really enjoy that. My name is Olger and I am from Albania.I am a MATC student and I like to speak good English,I'm learning English with this program.I work every day and some-time when I have free time I like to play football.MY favorite free time activity is to wolk at the park on the fresh air to relax. When my kids were small, we used to take a long walk in the neighborhood and the park.We played ball and went to the Swimming pool.Now my kids grew up I still do these activities with my Grandchildren. I like to take my niece and my dog to the park. We go to walk the dog and sometimes go swimming. Sometimes we go to watch the ducks in the water. Sunday we go to play in the games. And every summer my sister-in-law celebrates my nieces' birthdays. We go to the park when we have free time. I sometimes play soccer with my daughters.We like to play soccer. I enjoy being on a team with Alessandra, she is always crazy for the ball.When she can not get the ball,she catches it with her hand and then puts it in front of the goal. Then she makes a goal . We sometimes walk or to do races together in the park. We are happy. My favorite sport is baseball. The best ways to spent time with my family is we are going to take them to park and play together .My dream is to see my son play good professional baseball team becouse is the game of my old family playing. On my vacation I Like to go to Mexico with my family.I like to go to the ranch becouse there my kids can walk ride bikes and ride horses.There isn't trafic and there aren't many people .All the roads are safe .We like to go to swim in the rivers .There is frech corns and frech meat .There we cutch the the fish .In two or three hours we are eating . One activity I like to do with my family is we go to parks in summer.My family and my wife's relatives go to camping. My wife and her sister talk about our country. In the meantime, my daughter and her cousin play.My son and I enjoyed fishing.My family and I like go to camping because is very relaxing. My country is El Salvador. There are many mountains. My family and I we used to climb very often whenever we can. The mountains and forest are beautiful. The temperature is perfect about 8degrees C.The mountains block the rain carrying clouds from Pacific Ocean. We have Pacific Ocean alonside my country. We have many beaches,and many people went to swim in April. All employees took vacation in Easter week ,they have fun for one week in the beach. They have many ativity. They see when the sun rose and sun set.At night the moon is bright all night. I like to go along with my family to the park. There I spend a good time. My kids love to play on the swings and slides. Sometimes I take the chldren to teach swimming. I love walking in the park. My family and I are happy while we go to the park. I like to go with my family to Wisconsin Dells. It was special day because we all go together. We like to swim. My family is very important for me.If I have free time,I like to travel to another Country or city.Last year We went to Orlando-Florida.It is very hot,my family takes many pictures en diferent places.We are runnig and swimming all day because is very hot.I like to travel because i want know another culture and foods.My name is Juan Andrade,I from Peru. My name is Juan. I am Mexican and in my country I practice different sports. I was a sport teacher at the elementary school. My favorite sport is soccer. Here in Milwaukee I take my grandkids to the park and we play and walk around the park. I like summer because I can plant flowers and cook in the yard.I like walk, play outside and play with my childrens.My childrens are very energetic. They are the most energetic people I now.they play soccer and practice, We enjoy together. On vacacions We go to Michigan is very beautiful we can olay on the lake and We go to the farms.Is very quiet in the night. Hiking, biking or camping are good for family.They can build relationship between parents and children.We like to go to the beach because we can play soccer or eat lunch on the sand or relax under the sun. We can build castles with wet sand and swim. In the morning or at night we like to walk along the beach. We enjoy a lot. Would you like to try? I am Leticia. I from Mexico.I like to play ball and soccer with my family. We go to the park and lake or in the yard.It is fun because we all run and laugh. Those moments are very important to all my family. Spending time with my family is the best. My name is Meti. Im from macedonija. If I have free time. I like to play soccer, because my favorite gema , many people in my country like soccer. it's first game my country. and I like relax, play basquetball,know new place in ANTIOQUIA.... and be with family and friend.. I am WhanWhan, If I have freetime, I would like to go to around the world by myself. I love journey and I think I probably will to do it before I be old. if i have free time i will go swimming because exercising meke me fresh and relaxed. but if i had parents had outgoing personality i would go traveling with them but now id prefer to do sth i can alone. I´m from Chile. I like to read, go to the beach, or just walk along the park. We have beautiful places in the north, south and central part of the country. Snow, beaches, mountains, etc all in the same country. I think that if people decided to have outdoors activities with their families, they will have a lot of opportunities to strength each other. Also, I think it would be good for their health. I would like to go to movies with my friends in free time. If i have holidays i will make a trip with my family.This kind of things make me relax.At week ends i spend my time with my friends at the Bar.we have lot of fun there. I read the article about family members spending time together. Parents and children shall do something together as a memory. Also, it can improve the communication between the two generation. It's good to understand and help each other inthe family. In my free time I like dancing and drinking "chimarrão", that is a hot drink make with herb, or beer with my family or friends, talking and doing nothing. I like sleeping too, to rest a little, to go out with friends at night. In my vacation I am going to the US, in my friend's house in New York, but I think I am going to have a little difficulty to communicate in English in the begining, but when I go back, I am going to talk English very well, I hope. in my free time i usually together with my friends travel around Hanoi.This is a beautiful and accient city.We often prepare together tranditional foods.there are greatest times. When I have free time, I go for the beach. In my country, where a live now, there are a lot of beautiful beach in the caribean sea. I enjoy visit this place and feel the sea breeze on my face. I can relax my body on the sandy, close my eyes and hear the sound of the sea. go outdoor can helps your mind to get away from all thinks occupied your mind during the week and you'll be fresh after a hard working week. If I had free time today, I think I would start the day by swimming in the local pool; with the hope that there wouldn't be many people there. Then, I would go back home and have breakfast. If swimming tired me too much, I would have some rest. In the afternoon, I would have a walk in the forest. I like the smell of foliage and greenery. It rejuvenates me. In the evening, I'd watch a film, and read poetry or a novel, in peace. Nowadays people are always in a hurry. People suffer from an almost complete lack of time. And I think hiking seemed to be the ideal way to relax, to see everything with your own eyes. I come from Ecuador, in my free time I like to travel and stay together to my family , I saw the picture of your trip and I think it is a wonderful place in the US. I think we always need to focus on our career but without forget our families, because the family is the force that drive us to success . I´m from Brazil and when I have free time, I´d like to go with wife to visit my grandmother´s home and her father´s home. In our last vacation,we had free time a lot and we made a trip to the City in Brazil called Gramado. On this city, there are a lot of beautiful places that we knew. I think the best thing that I can do is hiking with a beautiful landscape like the picture you share with us. I love the outdoors too it's so relaxing and you leave for a while the stress of the city. And the company is the other complement to do this, maybe with your family and friends or just with your pet. Hi, I am from Honduras but I am living in Florida since 2008. I am taking classes of Esol, I consider that my English is not so good but I want to share with you. When I lived in my country usually I went to the river I enjoy swimming and my family too, I do not have babies yet but my sisters and broters have babies and all my familly love to swimm. I am going to go in Jully and we are planning to make a big bbq. I made a project about Utah(The behive state) in my English class and I hope that a day I can make a travel to know that amazing state, I want to know the Square Temple, Zion National Park,and The Great Salt Lake City. (I would like to see the salt) I want to pactice horseback, when I was a child my pather had a farm and my youngest brother and me enjoyed take care of the horses and the cows. I like go to the mountains, hiking, fishing and travel. thanks I am improving my english with your blog. It is very nice to spend a whole day in a national park! Well, i love to spend time with the people i love... any place it1s Ok to have fun... but i like outdoors too..
mountains, rivers and things like that. In the first place, I do like travelling. It reduces my stress from the hectic lifestyle in the city. Most preferably is the countryside in my country; with the fresh air, flora and fauna and friendly people, always make me feel free and calm. The topic introduce the travelling to discover the world includes the special area and how to prepair for a trip. I like travelling around the world, too. I like travelling around the world. I learn this lession the first, and I dont understant the concept of topic. I cant answer the question. I dont know how to listen and understand the ideas in lession. my name is fabian I'm 29 years after long time i decied to go back to college, it is a big challenge move ahead in life, before a just to work in retail and that was a horrible experience,now i can realize that i juts was lossing time; now i can realizes that make something of oneself takes time,effor and a lot of time, but you need to keep going, don't give up life is base on sacrifies,but be sure on the end the reward is the best prize better like the money. Stay hungry never get back. I also like outdoors, so, if I choose travel, I like beaultiful places with beath. I like meetins with friends and cook and eat with my family. I really enjoy it! My dream is travel around the world. I think this paragraph is talking about some course, and I feel this listening is very difficult, for the speaker speaks not clearly. Therefore, I feel difficult to do the listening question. As a senior high student,free time is a symbol of happiness and relaxing.It is only during the time that I can do something I truly want to do instead of just continuing studying,which often makes me feel exhausted.I frequently see comic books,read novles and watch TV as my pastime.When I enjoy them,it just likes entering another whole new world,where is no pain,no fight,no broken-heart. I am a mother of two kids. I almost spend all my time with the children along because my husband is always on his business trips. We like to do a lot of different activities like taking a walk in the woods, playing on playground, or traveling to attractive spots. When we have spent time together, the kids always asked me to tell the story of my childhood, but sometimes I couldn't recall so many things off the top of my head. I have tried to make something of myself in profession of teaching Chinese. However, I gradually realized the most important thing for me is the family and the happiness of the children. I wish they could get ahead in life one day,but I hope they would understand the meaning of happiness when they grow up. That means that you are fond of around your family all the time. I like this topic very much. But,my conutry don't have the big park like that. I wish i could have a change to visit a lot of sciences like that. I like the big park like that. I wish I have a chance to see there. I usually listen to music, swimming and hang out with my friends at free time. I refer hang out with my friends because it make me really comfortable. I can talk, play or eat anything I want. Travel is a good idea but I can't travel at free time. Because I live in the city and it is so far mountains, beaches or country sides. So I just travel on vacations, holidays. My favourite activity in travelling and taking pictures (animals, landscapes, portraits of people). hi everyone. I really like to travelling. It's make me refesh and more energy to continue working. I like to much to spend time with the nature because i can feel more confident and havea true peace in myself. I like so much outdoors activities. I love to travel and read books. In my free time, I like to read the bible and books, to do exercise, to go out with my family and friends, yesterday we went hiking through the mountain in Monte de la Cruz in San Rafael of Heredia, Costa Rica, there is a beautiful place to go hiking, it has a lot of roads surrounded of forest, the weather is cool a little bit cold, we walked through the forest and we found a little river then we walk along and we found a little waterfall. It was a beauty trip to share with my family. I sometimes go for a walk and hike and I think it`s very good and useful. Our family loves camping too. Here, in São Paulo state, we have beautiful beaches and all end of year camp in family with in-laws, uncles, cousins and parents, closed with nature and closed with family members. I love go out with my family to anywhere! I love traveling with my family and share good and memorables moments. What would I do if I had free time? The dream comes true because I start my holiday tommorow and I go to Chroatia with my husband!We planned this trip for over six months.The ticketc were bought via the Inernet-we are going partly by bus and partly by train- all together 20 hours.We have a lot of time for this trip.We are going to stay in Zadar in an apartament for 12 days.The flat is fuly furnished and equiped in all necesities/towels,plates, frying pans and so on/Zadar is souranded by beautiful islands. You can get there by ferry , what is cheap and quite comfortable.We are planing to go to island Premuda, a place popular among divers because of its clear clean water and colourful underwater life.It's of course a great place for swimming. I would like to talk about solar eclipses, namely, how ancient people responded to these bizarre events at first place. Long time ago, many people believed that solar eclipse is when a dragon animal attempted to eat the sun so they undertook measures directed to prevent this sort of occasion from happening. Thus, they did some kind of specific dancing and deceptive gestures so the dragon beast could be diverted from the sun, it means the moon just passed before the sun. Also, they were quite scared of such an nature phenomenon. I Like so much to go outside !! For example lakes, rivers, forest , but the most interesting for me is sky diving !! I enjoy a lot of time jumping from airplane !! My soul is free !!! If you don't do this never , you should do this anytime !! If I had time, but also if I had enough money I would travel to a foreign county and I would visit a city because I like the cities, at night I would go to a bar and I would dance all nigt long. If I had free time and enough money for everything, I would go to Switzerland for 1 month. I saw so many breathtaking views on the Internet, and heard from my friends telling about their trips to there. It was wonderful and I believe that one day my dream will come true. By the way, I will go to New Zealand in July this year. Hi! I am from Turkey and I like travelling very much. I save money all the year and then I use it for travelling. I do not enjoy staying at a hotel for days. I stay in a hotel only for one night then I travel to another place. Generally, I travel without plan because I think in this world every where and every people worth to see. Hi i'm from Vietnam and I'm 16 years old. I'm actually on my summer vacation so I can do whatever I want. I usually spend my free time on reading books and surfing the internet but another hobby of mine is wandering around the Old Quarter with my friends or going to an acoustic music session at an antique coffee shop on a Sunday night with my mother. Hi, I am from China. I like travelling and reading. One of my favorite entertainment is to read a interesting book on the beach or in a scenery park on a sunny day. Going to theatre is another pleasant time for me. For my daughter likes musical, we often go out in the afternoon and enjoy the idle about in a nearby park, waiting for watching the musical. This activity really strengthens my relationship with my daughter. Hello, there! If I had more free time and money, I would travel abroad with my wife. I would like to visit many beautiful countries in the World, especially places where speak english. Because I have been studying english for a half year, and I would like to learn a litlle bit more! I really like travelling when I am sad. I have traveled in diferent countries in europe. I have been in Czech Republic and Russia and I loved this countries. Well, in case I have spare time, I will spend the whole day alone being a couch potato and enjoy just doing nothing!! At the same time, if I had less pressure and busy days I would probably travel to one of the least famous touristic destinations and explore completely off the beaten track places. Actually, When I have time I would love to read some books that I've bought and put in my reading list for a while . Of course , I should reserve some time for recreations because this will refresh my brain , give me to calm down , to get away from stress and also from daily routine. On of the recreations that I love to do most is to go to watch movies in cinema with my wife or my friends, swimming also is my favourite hobby especially in the swimming pool. Family are forever and it have to be the most important for us. I like to travel with my kids, we love spend time camping in the forest and do fun activities like hiking, climbing, cooking, swimming, eating, exploring. My kids loves play board games, ride their bikes. I took my kids to Peru for vacations last year and we visit Cuzco Macchu Picchu- Peru, they have a blast! they love the whole place and the history behind. Well, I really love the beach and the ocean. But I like hiking as well. So living in a city where is easy to find a place to hike, I would try to do every week. My family is relatively small, just my parents, my brother and my wife. To keep a strong relationship, we need to spend time with each other. In my opinion , the most important thing is show respect to other. There is no way that a strong family can be built on a sand-base. For more things, you need to do some activities together. The more you spend hard time with each other, the better bonds you can keep with your family. This is a great history, I think the people to have to make things that really to like. Go hiking is very interesting, and many people can do it with their close-friends or their families to spend happy times. If I had a free time I would go to an open park that is called 'Parque da Independencia', in English you can write Independence's Park. I chose this place because I can skating there and it is very big. This place is located in Sao Paulo, Brazil, and it is very popular for people that live here. There are other popular parks in Sao Paulo but in my opinion Independence's Park is the best for the activitie that I wanna do! The national park most known in Guatemala may be the Zone 1 of the Caoital Park. You can see the National Palance, ans there is a veri beautiful font in thet middel, ans you can sit and pas a good time with your friends and family. Personally, I would go to the park. Sometimes it is a wonderful place to relax and enjoy my free time here. I also want to spend my free time at the beach because of the sunshine and the wind made it a wonderful time for me. Honestly!!! I will wake up at 5.00AM. Wash my face and go to basketball court. I start warm up,running,and practice all basic move of basketball. I have many new friends because of basketball. I have a good health because of basketball. This is why I play. If I had free time, I would do as same as you and also the most of the above that to go around the wild. I once went hiking on myself. The scenery was beautiful and unforgettable. That was just like an outbreak of my life. I felt myself entirely relaxed at the moment. Last but not least, thank you for everyone that shares their lives together in the community, thank you. If I had free time, I would go to Nepal with the objective of helping to build schools for children as they don't have the possibilities to learn in the best conditions that we have in Europe. The mentality, the culture and the environment are so different and I think it is a really changement of scenery to go, the nature is so present and we can connect with her. Nowaday, both children and adult are facing more private pressure from their life. However, some parents agure that children should spend much time taking knowledge so they don't have time to relax. First of all, in my opinion, entertainment is very important to refresh the brain after working hard. If they have stress lasts a long time, their productivity is not effective. In addition, watching TV or using internet are always the first choice for spending leisure time on but this way is only fast but not smart. Because of spending too much time with smart electronic devices may cause impair their eyes and brain. Children should under their parents's guide to shorten the time of watching TV and to avoid inappropriate contents. I prefer playing outside and interacting with other people to staying at home. In addition, parents should go outside and teach them soft skills such as survival skill, communication skill and so on. Some good activities are hiking, playing football, riding. For me, my favorite activity is traveling around my country even the world. Traveling brings positive effects to children. They can learns directly by looking at everything, learn how to greet the strangers, how to catch the local vehicles or what should they do when they are lost. The world contains many wonderful and secret things so people should go and discover to expand their knowledge. To conclude, I think children can learn much more during the spare time than in school. They will learn essential things what teachers don't give. If I have a free day to do whatever I want and I have money, probably I would go to a national park in Chile, where you can enjoy an exilaluration day. Maybe it would be at Torres del Paine, a fantastic place with incredible mountains and wildlife. There are plenty of long and beaultful hikes, that can be tough and a big challange also. I would like to go at some place where we will can go for fish, eat a lot of diferent type of fruit and in the night we will can make a campfire.